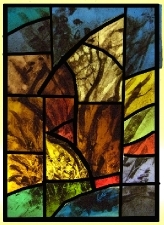 GLASS PAINTING - Using the traditional vitreous kiln-fired techniques . 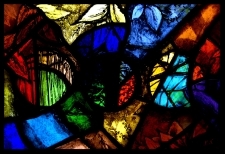 I offer stained glass courses - from design through to painting and construction of panels, with an emphasis on painting the glass. Painting on glass is important and it adds another vital dimension to coloured glass, Tuition is availablefor the beginner, to advanced glass painting in this challenging medium. The paint is composed of metal oxides and glass frit. When fired in a kiln the paint becomes fused onto the surface of the glass and is then completely permanent. I am able to take the student to a high level of multi-layer painting in comparitively short time. Paintng days at the studio are usually Thursdays, but times are flexible and can be arranged to suit. really pleased with my panel". 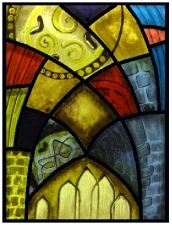 What a privilege to be taught by Andrew Taylor, stained glass artist. 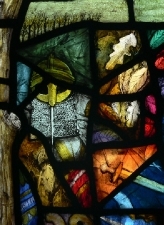 I would like to thank Andrew for teaching me his many years of knowledge, over a course of three days, helping me to produce a painted stained glass window that I am more than pleased with. Taught in a welcoming, friendly, relaxed atmosphere, where Andrew is very enthusiastic and supportive, to guide and share his knowledge and experience. I would thoroughly recommend this course."